Yes Rush, there IS resistance to Obama! Well, the time is now and that something is us! 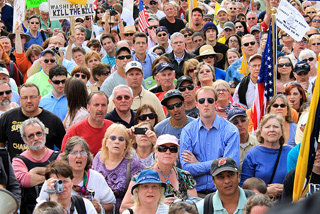 We The People in the form of the tea party are still here. Though severely wounded, extremely discouraged, brutally battered, devastatingly betrayed and soundly rejected, we the resistance survived and are poised for battle. What's that line from the pop song? "What doesn't kill you makes you stronger." We cried, moped and many in a moment of frustration and hopelessness, temporarily gave up. We are human. Our pain is great. But when the dust cleared, and upon stabilizing our emotions, patriots defaulted back to what motivated them to join the resistance four years ago – love – love for the greatest nation on the planet and a burning desire not to allow it to be transformed into an abomination of the vision of our Founding Fathers. No Mr President, not on our watch! As a Christian, I believe that as long as we stay faithful to Godly principles and values (Conservatism) we can expect a miracle at any moment. The Bible tells how one day Joseph was hopeless in prison with no release in sight. The next day Joseph was summoned to the King which led to him becoming a ruler, the King's right hand man. With God any and all things are possible. Also, history confirms that no one knows enough to be fatalistic. From the ashes of the Goldwater campaign came the beginning of the legacy of Ronald Reagan. After Bill Clinton beat George HW Bush in 1992 there was a sense that Clinton and the New Democrat Party were unstoppable, but it was the 1994 Midterms that saw the emergence of Newt Gingrich and the Republican Revolution that resulted in one of the largest shifts in political power in Congress in our nation's history. Someone wisely said, "Pray for help, but swim for home!" In other words, along with praying for our nation, the resistance/patriots are organizing, and preparing, everyone doing their part to restore America to the constitutional principles of individual liberty and freedom on which our country was founded. Resistance to Obama is out there folks. Karl Rove coming out of the closet announcing that the GOP is at war with the Tea Party could be a gift from God – serving to fire up demoralized patriots. Mr Rove, if you think the Tea Party was a force to be reckoned with in the past – you "ain't" seen nothing yet. So yes Virginia, there is a Santa Claus (Barack Obama). And yes Rush Limbaugh, there is resistance to Obama/Santa Claus – The Tea Party!